But the music isn’t the only thing to envy about the Oktoberfest. They also serve an array of fantastic food, including Hendl (roast chicken), Schweinehaxen (pork knuckles), Kartoffelsalat (potato salad), Schoko-oderglasierteFrüchte (chocolate-covered or glazed fruits) and Lebkuchenherzen (heart-shaped gingerbread cookies). The Lebkuchenherzen are sold on hanging ribbons and each are emblazoned with a term/phrase of endearment written in icing (like Ichhabdich so lieb = "I love you so much," or Schatz = “sweetheart," literally “treasure”). Oktoberfest-goers like to purchase these treats for their significant others, so it’s not uncommon to see men and women walking around with a Lebkuchenherz hanging from their neck. Some choose to eat the gingerbread right away while others hang it on their wall at home as a souvenir from the festival, allowing it to dry out and become an ornament. And you can’t forget the rides! Each year a number of carnival rides, including a full roller-coaster, are constructed on the Theresienwiese (meaning “the field, or meadow, of Therese”) in Munich. The Theresienwieseis often just called “theWiesn” for short, so if you hear somebody saying “I’ll meet you on the Wiesn,” that means that they’re planning to meet you at the Oktoberfest! In celebration of Oktoberfest, we are offering an Oktoberfest course for a limited time. 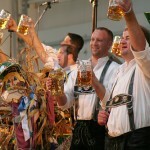 So jump into your lederhosen and learn how speak, and not just yodel, German for Oktoberfest. Click HERE to start learning! Do you have a special way of celebrating Oktoberfest? Have you ever been to Oktoberfest in Munich? Please share with us your favorite stories about this festive time of year!